Here we go. The 2018 National Convention Grappling Contest is here! The room is filled with highly skilled jujitsu and judo practitioners, which is a little intimidating. The feeling of ‘ohana is present and it is awesome. The first match is starting. Everybody is watching. The whole room is excited as the match goes on. My heart is pumping faster and faster as I am waiting for my name to be called. In my head, I am thinking, “how am I going to take my opponent down?” I don’t know who my opponent is going to be. I am in the heavyweight and advanced division. I am also thinking about my knee. I injured it a year and a half ago, full ACL tear and a partial tear on the meniscus, in a national judo competition. I’m about 80% recovered. I am worried. The theme of the clinic is courage and I am going to face my fear after a year and a half of recovery, physical training, mental training, and spiritual training. We both get up, my heart racing faster and faster, my breathing heavy, here we go again. Looking for a throw, I get pushed to the ground and we are grappling each other, trying to get a pin or tap. The contest is based on points, which I am not worried about. I am more focused on testing my jujitsu techniques. Again the referee says “MATTE!” No pins yet, just a few hold-downs. We both get up again. I’m exhausted, my heart feels like it is going to pop out of my chest, and my strength is gone. I have used all my strength and it is gone! Here we go again. 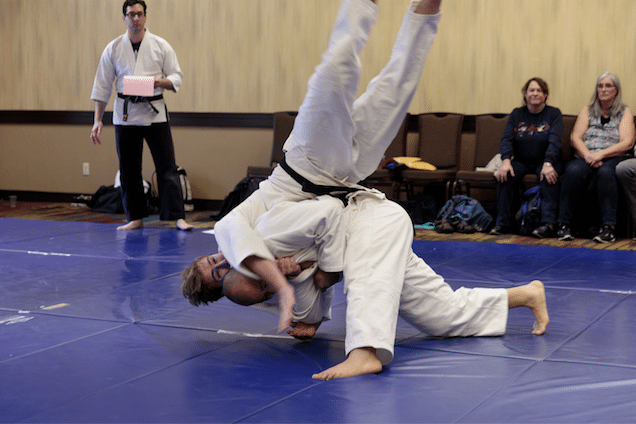 We are moving each other and I’m pushing and pulling and then I see a small window of opportunity to throw my opponent Seoi Nage, and I take it. It is a full commitment of pulling myself together and not giving up. By this time I am not worried about my knee anymore. There goes my opponent; his legs are up in the air and I’m pulling him down to the mat. BOOM! He lands. I go for a pin. He is fighting and I’m trying to hold him down. MATTE!! The match is over we face each other and bow. The referee calls out the results. I win the match. I shake my opponents hand and thank him. He is a highly skilled jujitsu practitioner. It is an amazing experience going against him and I thank him for giving a great challenge and lesson. I get off the mat and I’m exhausted. I sit on the side watching other matches, seeing great sportsmanship. Everybody is respectful and the most important part of this contest is the ‘ohana spirit inside the room. The next two matches I lose. I am amazed how much I learn from this experience. Thank you to my other two opponents for the great lessons! You guys know who you are. I can’t wait for next year’s AJJF national convention which will be in my hometown of Chicago, Illinois. This has been an awesome AJJF convention with the ‘ohana spirit present. I would like to thank my jujitsu teachers and ukes for the years of training and lessons you guys have taught me. I will see you guys in the next AJJF convention or sooner. Jose Gonzalez (DANZAN RYU OHANA).